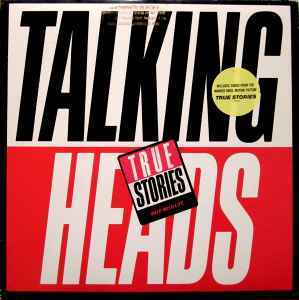 Copyright (c) – Talking Heads Tours Inc.
© 1986 Sire Records Company & Talking Heads Tour Inc.
All basic tracks recorded by Eric "E.T." Thorngren at Sigma Sound, New York and assisted by Melanie West & Nick Del Re. Additional musicians appearing on A2 recorded by the Omega Audio Remote Facility at the Arcadia Theater, Dallas; additional musicians appearing on A3, B2, B4, and B5 recorded at Studio Southwest, Sunnyvale, Texas. All songs mixed by Eric "E.T." Thorngren at The Village Recorder Studios, Westwood, California and assisted by Robin Laine, Charles Brocco and Tom Nist, except B4 by Lee Herschberg at Amigo Studios, North Hollywood & B1 by Mick Guzauski at Conway Recording Studios, Hollywood. Overdubs recorded by Eric "E.T." Thorngren at O'Henry Studios, Toluca Lake, California & assisted by Kathy Botich. Originally mastered digitally by Jack Skinner at Sterling Sound, New York. Label incorrectly lists duration of 3:14 for track B2. Cat # 1-25512 appears on the label. Cat # 9 25512-1 appears on the inner sleeve, bottom-right. "Little Creatures" was already a departure from the afrofunk-infused polyrhythms of "Fear Of Music", "Remain In Light" and "Speaking In Tongues", not to mention the side-projects of Tom Tom Club and Byrne/Eno. And as much as the characteristic sound of Talking Heads is present on "True Stories" (some of it leans back on "More Songs About Buildings And Food"), their sliding down towards country-rock music started to worry, the altogether impression being that of a letdown. At best, this could have been a solo effort by David Byrne (impersonating Tom Petty). And considering the album was a derivation of the soundtrack to David Byrne's film of the same name, the assumption of a solo album isn't entirely out of place. But in the context of a band that once made "Drugs", "The Overload" and "Listening Wind" to name a few, "True Stories" remains an anomaly. From the good side though - "Love For Sale" is a perfect song Pixies never came up with. The album continues as energetically with "Puzzlin' Evidence", another great tour-de-force number, with the album's highlight captured in side A's closing number, "Papa Legba" - echoing the darker edges from Talking Heads' earlier work. "Hey Now" and "Wild Wild Life" ride the enjoyable, carefree melody wave, but these set the tone for the most part of the record, reducing it down to a tired terrace-version of a superbly ecstatic band. "Radio Head" - the title made super-famous by Thom Yorke's experimental rock group - is so disappointingly mediocre. "People Like Us" and "Radio Operator" sadly stay safe with the same formula. The closing number comes in the shape of a ballad - "City Of Dreams" is an interesting diversion towards something Bowie forgot he recorded and Talking Heads discoveried it to their advantage. In this song there's also a slight trace of "Everyday Is Like Sunday", still a good two years before Morrissey actually went solo.